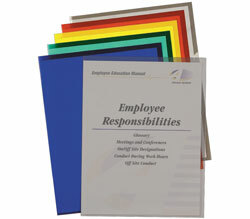 Report cover features swing clip design to hold papers firmly in place. Simply swing open clip, insert pages, and close clip to secure contents. Translucent two-tone polypropylene provides visibility while it protects. Swing clip allows for easy addition/removal of pages. Heavy duty polypropylene. Frosted clear cover with colorful back. Holds up to 30, 8-1/2 x 11 unpunched sheets. Assorted Tropic Tones colors include Seaside Blue, Sunny Yellow, Seafoam Green, Sunset Red, and Sandy Gray. 24/DS. Prepacked Shipper Display.